Dictionary.com defines a threshold as 'the sill of a doorway', 'the entrance to a house or building' or 'any place or point of entering or beginning'. A stress threshold is about that last one, it's the point at which you leave a place where you are coping with stress and enter one where you are not. In other words, where the stress landing on you becomes, like the ice bucket, an unpleasant deluge. We all have different thresholds for stress, and sometimes we have different thresholds for different kinds of stress. You might thrive on the kind of stress you get at work, for example, but find it difficult to deal with the kind you get at home. For just that reason, I prefer the concept of a container, like a bucket, more than a line. Imagine it this way. You have a bucket which holds around 2 gallons of water. You also have a leak in your roof. You place the bucket under the leak to catch the drips. As long as the water in the bucket is less than 2 gallons, everything is fine. Once there is more than 2 gallons, you have a problem - water spills over the top and floods your home, causing a lot more damage than just the roof: carpets, electrical, walls. Stress is just the same. None of us can entirely escape stress, but while your coping strategies are up to the job, everything goes pretty well. Once the stress you face is more than you can cope with, it overflows into other areas of your life - health, emotions, relationships, work etc - and causes more problems. 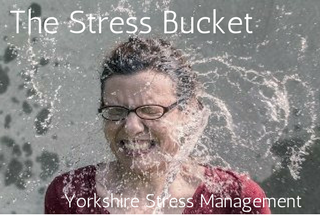 There are a few other things to note about this stress bucket. I've discussed these approaches in detail before - find my practical tips to effective stress management HERE.